For sale Villa with lovely open views in Moraira, located close to the town centre and walking distance to a few amenities.. An open plan living/dining with a fireplace with a log burning stove and a fully equipped kitchen with marble worktop. The Naya (covered terrace) and a large glazed porch are connected to the balcony. The property has 3 double bedrooms and 2 bathrooms Other features included are double glazed windows, central heating with radiators and hot and cold air-conditioning in the living area and two of the bedrooms. The Villa benefits from an alarm system. The outside area has an easy to maintain garden and a 8 x 4 Pool. 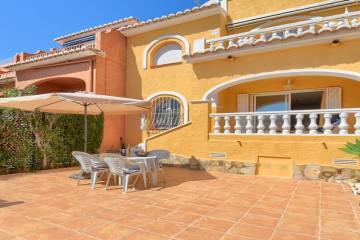 The property also offers plenty of parking and a 32m2 garage.